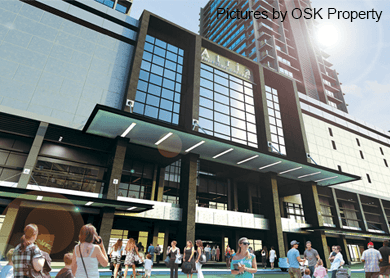 ALMOST four years after demolishing the 30-year-old Atria Shopping Centre in the SS22 commercial hub of Damansara Jaya, Selangor, developer OSK Property Holdings Bhd plans to open its sleek incarnation, Atria Shopping Gallery, on May 28. The 5.7-acre retail centre will have eight levels — five, from the lower ground to the third floor, for retail and three for parking, including one at basement level. Part of the second and third floors will also offer parking space for the convenience and safety of the shoppers. Coming up on top of the mall is Atria SoFo Suites, which comprises two 19-storey towers of small office/flexible offices (SoFos). The mall has a net lettable area (NLA) of 470,000 sq ft and gross floor area of 1.38 million sq ft, which includes the space for parking and M&E (mechanical and engineering) facilities. Its gross development value is RM700 million. Atria Shopping Gallery is positioned to not only cater for the middle to upper-income group in Damansara Jaya, Bandar Utama, SS2 and Taman Megah but also differentiate itself from its competitors, director of leasing Sally Low tells City & Country. Indeed, the mall is opening when Malaysia’s retail industry is facing challenging times. There is an oversupply of malls around the country, say real estate consultants. According to data from C H Williams Talhar and Wong Sdn Bhd (WTW), retail space in the Klang Valley, as at Dec 31, 2014, stood at 49.03 million sq ft while average occupancy was around 88%. “This year, the retail sector is expected to stay quiet with new mall owners likely to experience difficulty in maintaining occupancy in view of the likely completion of more shopping centres,” says the real estate agency. Besides Atria Shopping Gallery, other significant new retail developments coming up are phase three of Sunway Pyramid at Sunway Integrated Resort City, Sunway Putra Mall in Jalan Putra and Jakel Capsquare Mall in Jalan Munshi Abdullah in Kuala Lumpur, says WTW, adding that these will introduce about 2.1 million sq ft of NLA to the market. “All these retail centres are part of asset enhancement initiatives, except for Sunway Velocity Mall (in Cheras), which is a new project,” it says. Savills Malaysia managing director Allan Soo has this to say: “We have too many malls, period. There are already more than 150 in the Klang Valley alone, offering a combined 52 million sq ft of retail space or 7.6 sq ft per capita. We don’t need so many. These challenges, plus its high expectations, have resulted in OSK Property sparing no expense in making Atria Shopping Gallery a success. It has invested heavily in the mall’s retail mix, interior design and accessibility. “We really want the best for the mall. While we have a budget, since this mall is a flagship, the minute the boss (executive director Ong Ju Xing) sees there is a need to provide even more money, he approves it,” Low says. Apart from Atria Shopping Gallery which is the group’s flagship mall, there will be two more — one in Cheras and the other in Sungai Petani, Kedah — targeted at the mass market, she adds. They will offer a combined NLA of 1.16 million sq ft.
Atria Shopping Gallery will have a few anchor tenants consisting of some familiar names and some new ones. “For a neighbourhood mall, the anchor tenants cannot be department stores because they are too big and can occupy up to 25% of the space. So, we will have mini-anchor tenants instead, which is typical of a family mall,” Low explains. According to her, these are the Village Grocer supermarket, Chi Fitness gym, Jungle Gym children’s play centre, Times Bookstore, The Little Treehouse Kindergarten, Dynasty Dragon Chinese banquet restaurant, Nilufar Petstore, Hamleys UK toy shop, a premium HKL Electrical store, Ace Hardware, Sports Direct.com, Terranova high-street fashion store, NEXT UK clothing store and MNG, which includes MNG Kids, Violetta and MNG Man. Popular dining option Dynasty Dragon, which was formerly at SS2 Mall in Petaling Jaya, will occupy 25,000 sq ft. It has already received at least three bookings for wedding banquets ahead of the mall’s opening, Low notes. “In Petaling Jaya, restaurants that can host banquets and weddings are really popular because of the number of families living in the area. These places are always packed. In fact, Dynasty Dragon was asked if it could hold a wedding banquet on the day of the launch itself. But to have the couple ‘officiate’ at the opening [of Atria Shopping Gallery] didn’t sound right lah,” she laughs. The MNG store will be the biggest one in Malaysia, occupying almost 10,000 sq ft, says Low, adding that it will boast the latest collections from Europe. Atria Shopping Gallery’s smaller retailers are no less interesting. Some of the F&B tenants may be familiar names but they will introduce new concepts, says Low. Two of these are Japanese restaurant Kame Sushi and the Antipodean Café. The former is making its first appearance in a mall while the latter is setting up an upscale version of its cafés. Currently, 82% of Atria Shopping Gallery has been leased out. “No mall will be able to, or want to, lease out 100%. We do have a list of potential tenants with whom we hope to close deals soon. It’s just a matter of them meeting the deadline for renovating their lots,” says Low. The retailers were selected with a discerning eye for the long-term benefit of the mall, she adds. OSK Property is targeting 15,000 visitors per weekday and 30,000 visitors per day on the weekends, Low adds. LandServe Sdn Bhd managing director Chen King Hoaw says the number of tenants that have signed up is heartening. However, he notes that some tenants may wish to delay their opening until the mall has gained traction. Savills’ Soo observes that fast fashion brands will likely remain popular due to their competitive pricing strategies but this will exert pressure on local brands in the segment. “F&B will be affected by GST and we can already see that the new tax system is causing unhappiness among the retailers. I think the segment will consolidate further but with the funds coming in to acquire some of these groups, we can expect a turf war and some casualties,” he says. To overcome the challenges posed by the location — bad traffic and congestion due to a shortage of parking space, compounded by the ongoing construction works on the mall — OSK Property is undertaking, at its own expense, activities such as road levelling between the mall and the shophouses that face the building, re-tarring and doubling the width of the immediate and secondary roads around the mall to 40 ft, enhancing the road kerbs, improving the drainage system and planting new trees, says director of centre management Lee Beng Beng. To top it all, it has — with the permission of the Petaling Jaya City Council — changed traffic flow to one way and installed three new traffic lights and upgraded the old one, he adds. “As with any new development, there are obviously some enhancements (of the surrounding area that) we have to look into. We are doing this not because we are the single biggest investor in Damansara Jaya but because we want the neighbourhood to benefit from the upgrade. “Although it’s still very congested because the car parks are not open yet, we’ve designed the mall in such a way that it will ease future congestion. There are five drop-off and pick-up points. One of the drop-off points is elevated — one floor above road level — which is also aimed at dispersing traffic,” says Lee. Some 1,700 parking bays will be provided once the mall is opened, nearly triple the number of bays offered by the old Atria. This should alleviate the parking problem in the area, Lee adds. All the effort being poured into the mall aside, it still remains to be seen if Atria Shopping Gallery will get off the ground in good time. However, once it is open, this new entrant into Petaling Jaya’s retail industry may well give the market the jolt it needs. This article first appeared in City & Country, The Edge Malaysia Weekly, on April 27 - May 3, 2015.